COI Track can prevent significant liabilities to your organization by addressing insurer requirements and tracking expiration dates on certificates of insurance (COI). COI Track is designed to track certificates of liability and property insurance. The program automates this tracking process by monitoring each certificate’s expiration dates and liability limits, providing reminders of upcoming dates to prevent liability risks. Contractors, vendors and suppliers can be contacted directly from the system, allowing for a seamless COI management process. This section will help guide you through the steps and best practices to set up and begin using the COI Track application. If you have any questions or need any assistance, please feel free to contact us using the options to the right. If you plan to use multiple sites in your account, you should set those up before getting started with COI Track. COI Track can be configured to send a weekly email summarizing certificates that may require attention to all users in your account who have access to the application. This email is useful for keeping track of expiring or invalid certificates without needing to access the platform and run reports. This support article covers notification settings in greater detail. Producers, projects, and vendors can all be imported into COI Track using these steps. 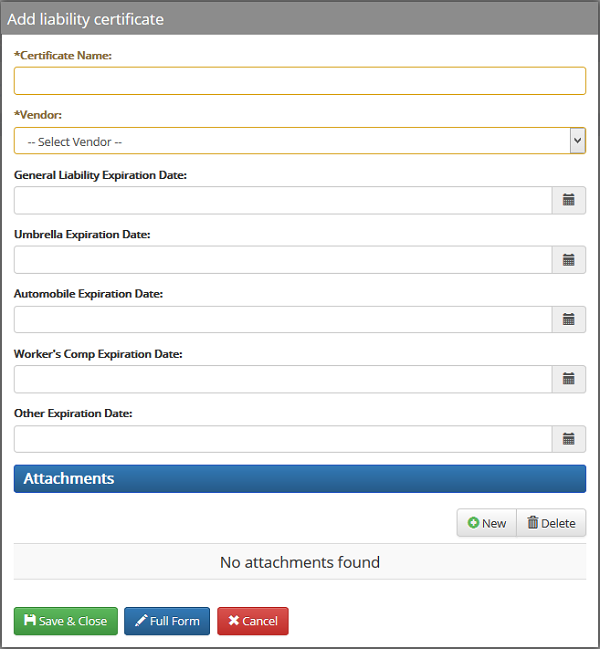 Vendor information is required to save a certificate record, but can also be added on-the-fly while recording a certificate. Projects provide a method to organize vendors and certificates are required to send certificate requests. You can record certificates using the short form, which only tracks expiration dates, or the long form, which tracks each value in a certificate. Minimum requirements provide a method to validate values for each line of insurance in the long form and ensure that they meet your requirements. Minimum requirements can be applied per line of insurance or organized into sets to apply to a full certificate. Click here to read more about setting up minimum requirements in your account. You can contact your vendors to request new certificates or notify them of issues with the certificates that you have on file. Mailing templates are organized into categories according to their usage and can be completely customized. COI Track includes placeholders, similar to a mail-merge feature, that allows you to insert various data points into your templates. Multiple mailing templates can be organized into workflows. Contact with vendors is partially automated in that workflow position is saved in the system, but each contact must be initiated by a user. Mailing templates can either be sent as email or downloaded to send through physical mail. You can read more about mailing templates and workflows here. You are ready to begin recording certificates in your account. This help article provides instruction for filling both the short and long certificate forms.